Get to hear their greatest songs such as Hanging By A Moment, Everything, You and Me, Sick Cycle Carousel, and a whole lot more. They will be performing live for one night only, as they resurface for their Filipino fans this 8th of October 2015! The rock trio who have produced numerous hit songs and multi-platinum albums returns to Manila this October. 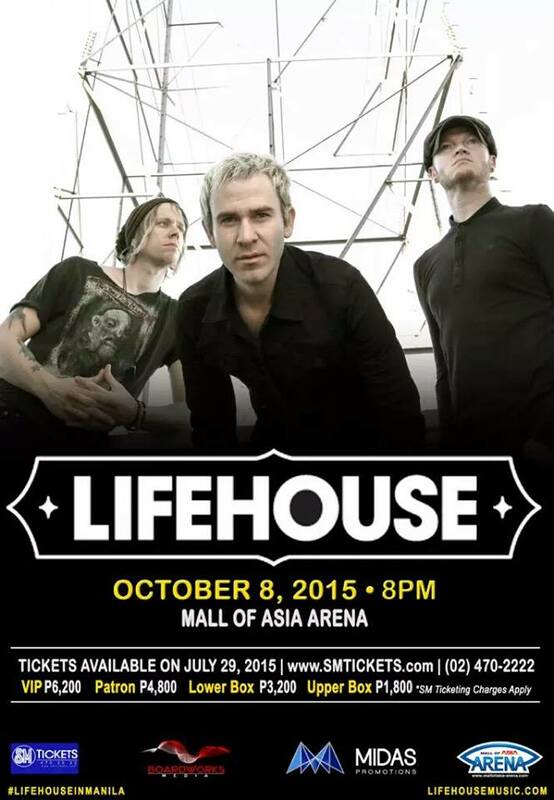 It’s Lifehouse Live in Manila at the Mall of Asia Arena in Pasay City. With the new album Out of the Wasteland, Jason Wade, Rick Woolstenhulme, Jr. and Bryce Soderberg are back with their blend of pop/rock melodies. For ticket info, visit to www.SMtickets.com or call 470-2222. Tickets will be available starting July 31, 2015. For more info on the band visit to www.lifehousemusic.com and www.facebook.com/lifehouse.